Skip bins are undoubtedly the most popular choice when it comes to rubbish removal in Brisbane. After all, they make waste removal ridiculously simple. However, there are certain misconceptions about skip-bins that I hear time and time again. So, as the owner of 4 Waste Removals, a company that offers skip bins on hire in Brisbane, today I want to dispel some of these myths. Hopefully, you’ll learn something new about skip bins from today’s article. This is one of the most common misconceptions about skip bin hire that I hear. Most people who haven’t hired a skip before think that it will be cheaper to take care of their remove rubbish themselves. However, if you choose to do so, you’ll need to collect all your rubbish, hire a truck / UTE and then drive your waste to the tip and back. You’ll spend a lot of money, time and effort in the process. On the other hand, when you hire a skip bin, you only need to pay for the skip hire costs. Regardless of the amount of rubbish you’re looking to get rid of, hiring a skip bin will always offer better value than trying to remove rubbish by yourself. Another common myth surrounding skip bins is that waste dumped in skip bins goes directly to landfills. This is quite far from the truth as most skip bin providers, including us at 4 Waste Removals, have access to recycling facilities and rubbish tips in and around Brisbane and do due diligence to ensure as little waste as possible goes to landfill. By hiring one of our skip bins, you can ensure that your rubbish is properly disposed of and that recyclable waste does not end up contributing to landfill waste. Many people think that hiring a skip bin is a hassle because you never get the right size – you hire one that’s either too big or too small. While you will have to select a skip size with other skip bin providers in Brisbane, you won’t face this problem with us at 4 Waste Removals because of our ‘one-size-fits-all’ skip bins. Our skip bins come in a standard size with fill capacities ranging from 2m³-12m³. With us, you only need to hire a skip, and there is no size estimation involved. We’ll charge you based on the amount of rubbish you fill into our skips and not for the entire skip size. Look how easy it is to fill a 4 Waste skip bin!! A lot of people think that skip bins are difficult to fill. Well, this may be true if you’re looking to lift heavy waste materials over the sides of skip walls. However, if you choose our skip bins at 4 Waste Removals, you won’t face this problem at all. This is because our skip bins feature a unique hinged door at the rear which can be opened 270 degrees, and there is no lip. Due to this, you can simply use a wheelbarrow and wheel your waste right into the skip. Filling 4 Waste Removals skip bins easy, effortless and safe. There are several misconceptions surrounding skip bins. Some of these are that hiring a skip bin is expensive, using a skip bin contributes to landfill waste, you never get the right sized skip, and that skip bins are difficult to fill. The reality is that skip hire is affordable, waste from skip bins is sent to rubbish tips and recycling facilities, skips are also available in single sized options, and it can be easy to fill walk-in skip bins. 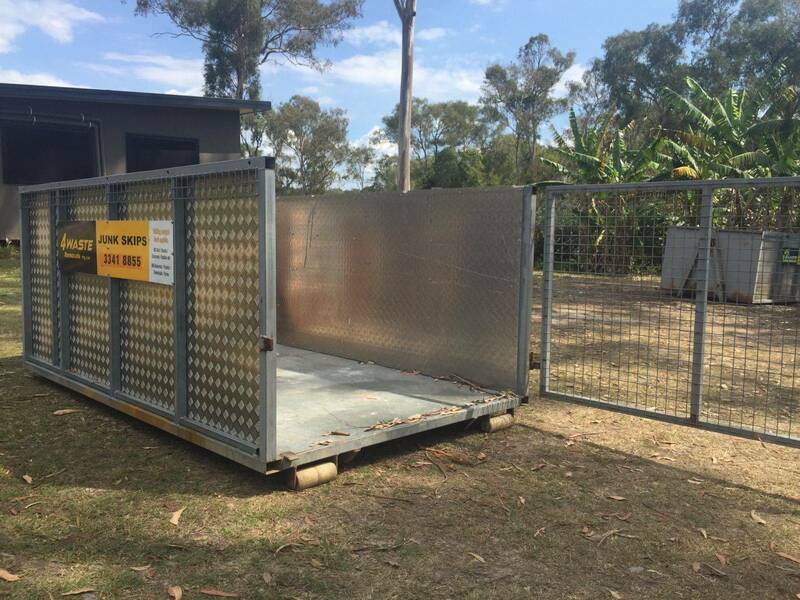 And, for affordable and reliable walk-in skip bin hire in Brisbane, look no further than us here at 4 Waste Removals. To hire a skip bin from us, give us a call on 07 3343 3030 or click here to hire a skip today!